Today’s chiropractor may be dubbed the “New Hero” in healthcare. Chiropractic care is about “preventive care” and helping your body do what it was designed to do, which is to take care of itself naturally. 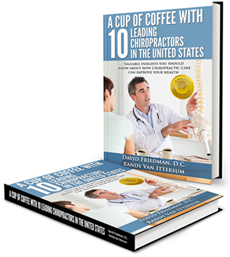 Dr. David Friedman and Randy Van Ittersum bring together ten of America’s leading chiropractors to share with you their insights into natural alternative care and the positive effect it can have on your health. You will discover why a chiropractor should be one of your primary caregivers. The benefits of chiropractic treatment can be remarkable. In this #1 national bestselling book, you’ll read amazing stories about ordinary people, celebrities to famous sports icons who all rely on chiropractic care to keep them healthy and active.